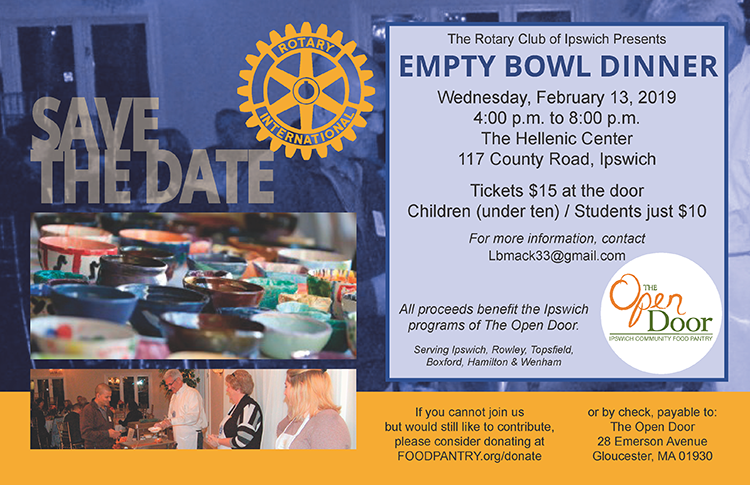 The Rotary Club of Ipswich is hosting the 1st Annual Empty Bowl Dinner for The Open Door Ipswich Food Pantry on Wednesday, February 13th at the Hellenic Center, 117 County Road, Ipswich. Empty Bowl events are held nationally to generate awareness concerning hunger and to raise money for local hunger-relief programs. Come join the Rotary Club of Ipswich as we work to eliminate food insecurity in our communities.